19 February 2016. 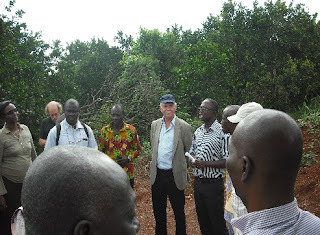 Kade (120 Km from Accra, Ghana) Eastern Region citrus producers. The SSA CP support closed on 19th February 2016. GIZ came in also to build and strengthen the capacity of citrus producers and has sensitized some producers who were not initially in IPs to join them. Very recently ECOWAS has funded the Fruit Fly Project in 8 countries (including Ghana, Cote d’Ivoire, Burkina Faso, Senegal, Mali etc.) with a total amount of 23,312,000 USD for 3 years. Professor Kwame Afreh-Nuamah of School of Agriculture, College of Basic and Applied Sciences, University of Ghana, is the Chairman of the Fruit Fly National Committee. He attended the workshop. He said that the chairman of the Citrus Innovation Platform will be included in the Committee and will seat in the next meeting planned in April. CORAF has also funded the ARD component (research) of the Fruit Fly Project with 2.5 million USD. In Ghana this component is led by Dr Maxwell K. Billah of University of Ghana who attended the workshop as well. The SSA CP is a FARA program funded by the European Commission through IFAD. The program has specialized in Integrated Agricultural Research Development (IAR4D) with the Integrated Innovation Platform (IP) approach where researchers, private sector including banks, NGOs, farmers create/form a forum to reflect and invent solutions to their challenges. A training on IP management involved some 30 members of the citrus producers association and researchers. It was organized in Kumasi in August 2014. A field visit was organised and the Mankranso. The IP was officially launched in the presence of the District Chief Officer, two members of the Parliament of Ghana and many other dignitaries.